Now the Fireman Sam : Fire & Rescue game is available for Android. It’s been available for iOS already but is now also listed on Amazon, Google Play, Samsung and Nook App Stores for £1.99 / $2.99 USD. Get it here if you’ve got Google Play or Amazon here. The game features a special reward sticker book and in-games such as Mountain Adventure, where you need to use your helicopter to lift everyone to safety. There’s also Neptune’s Mission, where you need to rescue villagers from the water, and Fire Engine Rescue , where you use your fire engine to put the fires out across Pontypandy. There’s more games too, and they’re all geared to pre-school kids. Get more details below. LONDON & NEW YORK – 8th August, 2014–P2 Games, leading children’s interactive publisher, and HIT Entertainment, one of the world’s leading preschool entertainment companies, today announced that the popular app Fireman Sam™: Fire & Rescue is now available for Android smart phone and tablet users and can be downloaded from the Amazon, Google Play, Samsung and Nook App Stores for £1.99 / $2.99 USD. 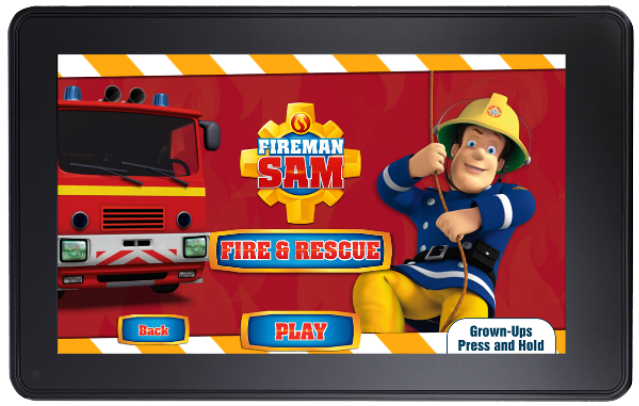 Fireman Sam: Fire & Rescue follows the success of the first app release, Fireman Sam: Junior Cadet, and offers more content and five exciting games and bonus features including videos and multiplayer functions. Fireman Sam is back with a brand new adventure – Fire & Rescue. Young players can join Fireman Sam and the rest of the Pontypandy Fire Crew as they take on heroic rescues, action-packed emergencies and important training. The app also has a special reward sticker book where fans can collect stickers during game-play and a video player to unlock video clips. · Mountain Adventure – Some of the villagers are stuck on a mountain ledge near The Mountain Activity Centre. Use the helicopter to lift everyone to safety! · Neptune’s Mission – Part of the jetty has dislodged and some villagers have fallen into the water. Use Neptune to bring the villagers safely back to shore. · Fire Engine Rescue –Rescue the people of Pontypandy and put out the fires as quickly as you can. · Connect the Hose – Jupiter’s hose needs to be mended. Help Fireman Sam connect the correct pieces to get the water flowing. · Quad Bike Training – Join Fireman Sam on a training exercise to learn how to use the new Quad Bike. Avoid obstacles and complete the training course as quickly as you can. A must-have for fans, Fireman Sam: Fire & Rescue features the familiar characters, music and sound effects from the hit TV show, giving young children a fun and entertaining experience with their favorite ‘hero next door’. With colorful animation, touch screen control and helpful audio prompts, this new app provides fans with a single or multiplayer option. The app has both ‘easy’ and ‘hard’ level settings so children can enjoy with or without parental assistance. The Fireman Sam: Fire & Rescue app can be downloaded for £1.99 / $2.99 USD from the Amazon, Google Play, Samsung, Nook and Apple App Stores. Visit www.p2games.co.uk for more information.